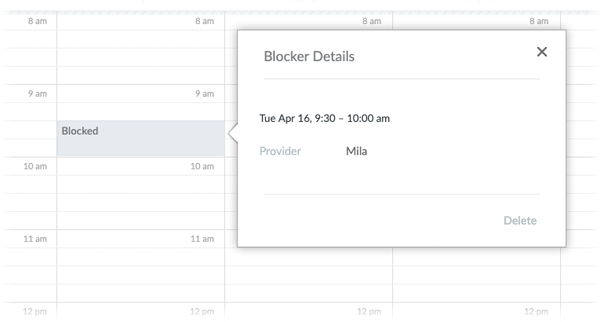 Slot blockers allow you to block out a length of time in your calendar, preventing either staff or customers from scheduling an appointment within that timeframe. This can be used for blocking out time for closures, prep time, meetings, vacations, sick leave, and so on. Time slots that are blocked out will become unavailable on the Booking Page as well. First, tap the pink (+) button and select + Slot Blocker. Next, select the staff member whose calendar will be blocked, and choose the time when the slot blocker will begin. Note that available time slots will appear in white boxes, and off-hours time slots will appear in grey. You may still add a slot blocker during off-hours time. And that's it! The slot blocker will appear on the specified staff member's calendar. To edit or delete the blocker, tap on it to bring up the details menu and continue with your desired changes. Note: Slot blockers only show up in daily or weekly view. They will not show on the monthly calendar view. To get started, click anywhere on your calendar to start an appointment. Then use the Service dropdown menu to select "Slot Blocker." Next, specify the duration for the Slot Blocker and then click the Save Blocker button. The blocker will appear on your calendar at the chosen time. Drag and drop the blocker into a new time slot to reschedule it. Click on the blocker to bring up its details menu or delete it. Blocking off more than 1 day? If you need to block more than 24 hours on your calendar, or you need to schedule recurring breaks, use the Staff Working Hours and Time Off feature instead. These options are accessible under Account > Staff in the Setmore mobile app, or under Settings > Staff in the Setmore web app.